Dallas — The costliest natural disaster in Colorado history, floods across the Front Range in the fall of 2013 caused widespread damage to critical infrastructure, transportation networks such as U.S. Highway 34 (US 34), homes, and businesses — nearly $4 billion in destruction. Especially devastating for mountain and rural corridors north of Denver, in the Big Thompson River canyon, floods destroyed more than 10 miles of the US 34 roadway embankment, washed out homes, and took the lives of two. Having experienced similar devastation in 1976, the Colorado Department of Transportation (CDOT) wasn’t satisfied with just implementing a short-term end solution; rather, they committed to completing emergency, temporary repairs, followed by a flexible and resilient permanent solution – for which they engaged Jacobs. Jacobs served as the prime consultant and design lead for the US 34 Big Thompson Canyon Permanent Repair project that Engineering News-Record just named as the 2018 Overall National Best of the Best Project. The project, which included 23 miles of design, construction, and traffic control measures, also received the ENR Best of the Best Highway/Bridge award for 2018. The Best of the Best Project Awards recognize the pinnacle of design and construction achievement among projects completed in the U.S. ENR selected the US 34 Big Thompson Canyon Permanent Repair project from more than 820 projects nominated through regional competitions in 2018. ENR’s Mountain States Region recognized the project with a Judges Special Recognition and as its 2018 Highway/Bridge Best Project. The extensive rainfall and duration of the 2013 floods resulted in flow surges exceeding the 500-year flood event and major sections of roadway were washed away completely, along with access bridges and retaining walls. Due to the damages to the road, residents in the canyon were cut off from emergency services and more than 2,000 people needed to be evacuated to safe areas via helicopter. “This project was about more than just restoring a 23-mile long section of highway. It was also about restoring the community’s sense of security,” says Jacobs Global Vice President of Transportation Kevin Slack. “Residents in the Big Thompson Canyon experienced an event that took lives, wiped away homes, cars and much of the highway connecting their communities. With the canyon inaccessible by vehicles, the airlift operations that took place in the days after the flood were second only to those conducted for Hurricane Katrina victims. After identifying common areas of damage from previous flood events, Jacobs’ project team, which included Kiewit Infrastructure as general contractor, identified resiliency measures to offer the best long-term public safety. Knowing that flood-proofing the entire canyon wasn’t feasible, Jacobs incorporated design and methods such as soil cement mixing, installing matrix riprap, moving the roadway onto bedrock, swapping the alignment of the road and the river and a unique approach to traffic control to preserve at least 15 feet of roadway for getting people in and out of the canyon in the next flood event and achieve maximum resiliency. 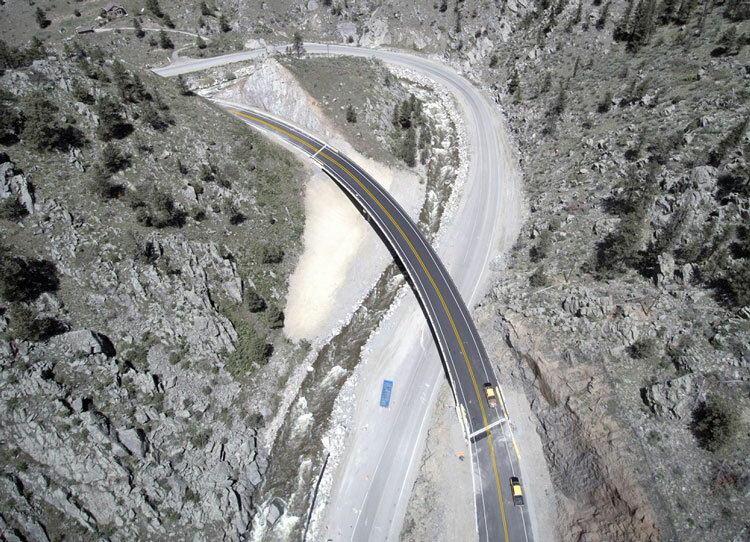 The US 34 Big Thompson Canyon Permanent Repair project, deemed best overall in terms of teamwork, safety, overcoming challenges, innovation and quality, will be recognized at ENR’s Best of the Best Projects Awards Banquet on March 21, 2019 in New York City. The American Council of Engineering Companies of Colorado (ACEC Colorado) also presented the project with a 2019 Excellence Award. Jacobs’ work with CDOT includes design of enhancements on an 18-mile critical stretch of Colorado’s overcrowded Interstate-25 transportation system between the state’s two largest cities, Denver and Colorado Springs; serving as lead engineer on the team developing the $1.2 billion reconstruction and expansion of Interstate-70 across north Denver; and delivering program support services for CDOT’s bold and forward-thinking RoadX Program, which will support Colorado’s continued economic vitality by transforming the state’s aging transportation system the advancement of comprehensive technology solutions.